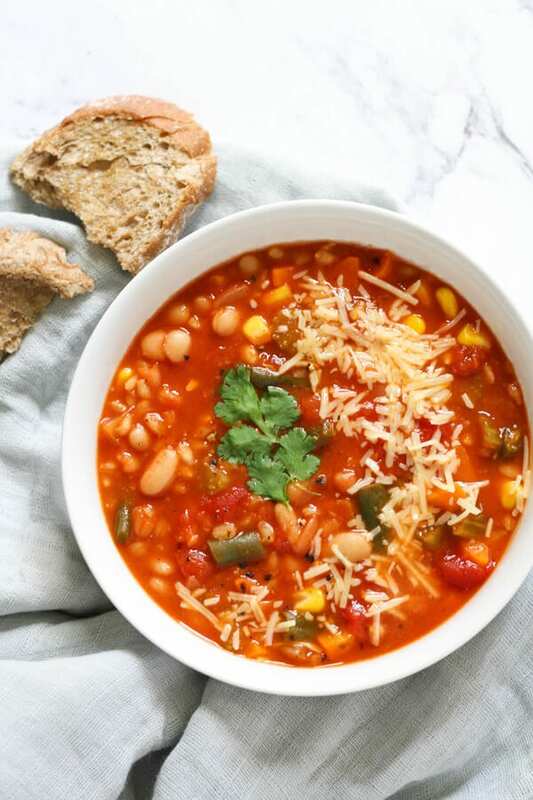 A warm and comforting vegetable barley soup that can be cooked in a pressure cooker, instant pot or stove top. Made with simple, everyday ingredients and ready in less than an hour whichever method you choose. Who got an Instant Pot / Pressure Cooker for Christmas? Unfortunately we don’t have Instant Pots in Australia BUT I did get a Phillips All-In-One Cooker which amongst other things is an electric pressure cooker and I’ve been having a blast learning how to use it. This Vegetable Barley Soup is the first thing I made in it, and was one of those “chuck in a bunch of ingredients and hope for the best” recipes. Don’t you just love when those work out? I find soup is generally very forgiving. 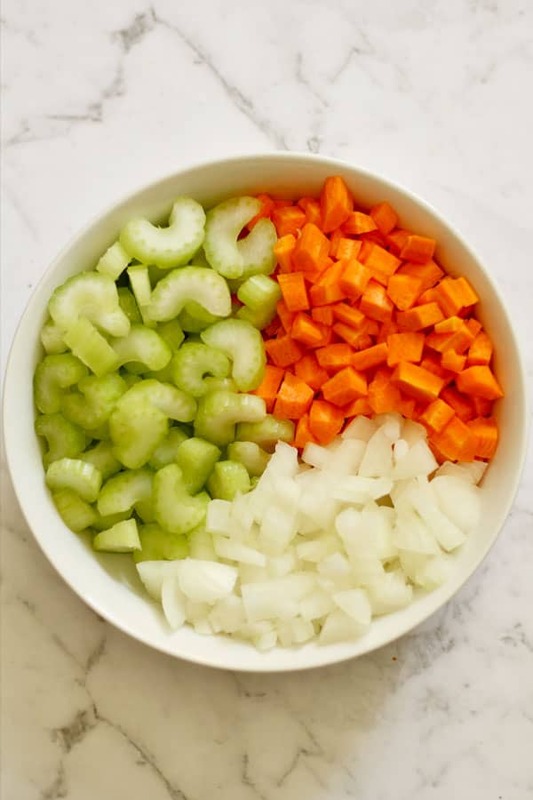 Start with mirepoix, add some other vegetables, beans, stock, tinned tomatoes, grains and seasoning and you’ll no doubt end up with an edible creation. But this soup was much more than just edible – it was absolutely moreish. After I polished off my first bowl I found myself heading straight back for seconds. And I was legitimately excited to eat leftovers the next day, AND the day after that. You can eat the soup as is but I highly recommend sprinkling some parmesan cheese on top and mopping it up with a toasted slice of sourdough. Perfection! Make up a batch at the start of the week and use it as an easy work lunch or a quick dinner. Or portion out and freeze it for those times you are in a pinch. Pearl Barley – OR you could use farro if you’d prefer. Green Beans – Either fresh or frozen. Cannellini Beans – Or you could use chickpeas or red kidney beans if you’d prefer. 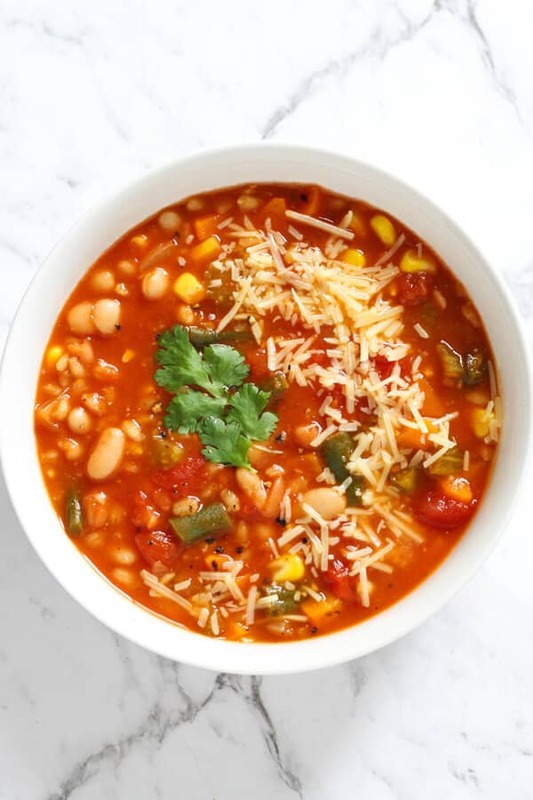 I use canned beans but if you’d prefer to use dry – go for it. Chicken Stock – OR you could use vegetable stock if you’d prefer. Cayenne Pepper, Basil, Oregano, Salt & Pepper – I like how the cayenne pepper gives it a little kick. Corn Kernels – Either fresh or frozen. First, select sauté mode on Instant Pot or pressure cooker. Heat the oil, then add onion, carrot, celery and minced garlic and cook, stirring regularly, for 3-5 minutes (photo 1). Next, add everything else except for the corn kernels in the Instant Pot or pressure cooker. Set to high pressure for 20 minutes. Release the steam (photo 2). Stir in the corn kernels. Set to high pressure for another 5 minutes. Release the steam (photo 3). Let the soup rest for a few minutes to allow it to thicken slightly. Serve with your favourite toppings (parmesan, crusty bread etc.) and enjoy (photo 4). Heat oil in a large pot on medium heat, then add onion, carrot, celery and minced garlic and cook, stirring regularly, for 3-5 minutes. Add everything else except for the corn kernels to the pot and bring to boil, then reduce to simmer for 20-30 minutes until the barley is cooked. Add corn kernels to the pot and simmer until cooked, around 5 minutes. Serve with your favourite toppings (parmesan, crusty bread etc) and enjoy. 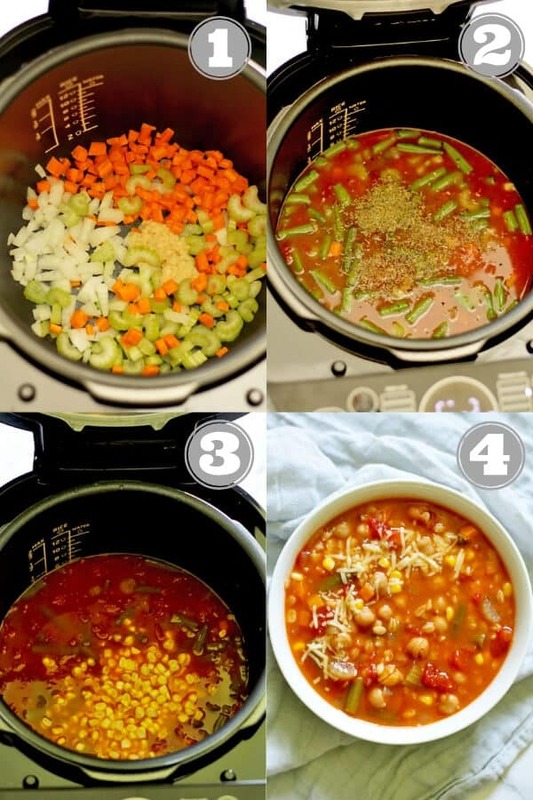 If you’ve tried this Vegetable Barley Soup I’d love to hear how you enjoyed it! Pop a comment and a star rating below! You can also FOLLOW ME on FACEBOOK, INSTAGRAM and PINTEREST to keep up to date with more delicious recipes. Select saute mode on Instant Pot or pressure cooker. Heat the oil, then add onion, carrot, celery and minced garlic and cook, stirring regularly, for 3-5 minutes. Add everything else except for the corn kernels in the Instant Pot or pressure cooker. Set to high pressure for 20 minutes. Release the steam. Stir in the corn kernels. Set to high pressure for another 5 minutes. Release the steam. Let the soup rest for a few minutes to allow it to thicken slightly. Serve with your favourite toppings (parmesan, crusty bread etc) and enjoy. Beans - I've made this with both chickpeas and cannellini beans and loved both. Feel free to add what you have on hand. I use tinned beans but if you'd prefer to use dry - go for it. Corn - I generally cut kernels off an uncooked cob to pop into this soup but you could easily sub for 1/2 a cup of frozen corn kernels. Grains - This soup lends itself well to substitutions, so feel free to try it with your favourite grain. I think farro would be wonderful. 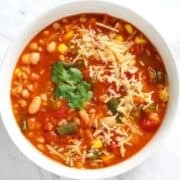 Vegetables - I almost always have green beans in the fridge so they were any easy choice to include in this soup. Feel free to experiment with whatever you have on hand - zucchini, frozen peas etc. Storage - Store in an airtight container in the fridge for 4 days, or in the freezer for 3 months. Nutrition - Nutrition information is from a nutrition calculator and is based around one serve. I’m SO happy to hear that Julie! I absolutely adore this soup.